You may be hesitant when thinking about dog crates for that furry member of your family. They somewhat resemble prisons. Even so, dog crates are excellent at providing your dog with a sense of being in a “den-like” environment like the ones their ancestors made. More importantly though is that a good crate can keep them safe whether they’re home or traveling with you. As a crate will essentially be your dog’s “home within a home”, it’s vital that you choose the right one for you and your dog’s specific needs. You want them to be as comfortable as they are safe. In an effort to help steer you in the right direction, the following guide will touch on everything you should know about today’s best dog crates. A wire dog crate is perhaps one of the most common and recognizable styles. They can be found in kennels, veterinary hospitals, and even dog shows. The main reason is because it provides a clear sight of the dog at all times. They are one of the types of crates that can be used for travel purposes. Typically, many wire crates can collapse to make it easier to transport. This also makes for storing it out of the way when not in use an easy task. Another advantage found with wire dog crates is that they have maximum airflow. If you live in a warmer environment or have long-haired dogs, proper ventilation can help make them feel more comfortable. Also, wire crates are super easy to maintain and clean, which can be more beneficial if you have a puppy still undergoing house training. On the downside, wire crates can get on the heavy side. If you are traveling in a car with one, it can turn into a hassle getting it in and out of the car. Also, though visibility can help you keep an eye on your dog, it may lead to anxiety for them as they can see the activities they aren’t allowed to partake in. As plastic dog crates are considerably lighter than wire crates, these are known to be more portable. You are more likely to use one of these when you want to travel via plane with your pet. Concerning the appearance of these crates, they have a hard plastic shell and a wired door at the front. Around the sides of the shell you’ll notice slits/holes that help with ventilation. Though this type of crate may not be ideal for warm weather, it does provide enough insulation for the colder months. There is a limited amount of visibility with a plastic dog crate. This may or may not be good depending on your dog’s behavior and personality. Plastic can also trap in odors, which may not be the best if your pup has a tendency to eliminate in its crate. Plastic designs often can require more cleaning compared to a wire dog crate. However, many of them feature a removable tray in order to place food inside. It may require more hands-on maintenance, but actually cleaning it isn’t difficult. For those of you looking for something extremely light in weight, then soft-sided crates may be a better choice. These are generally fabric decorated over a metal frame or made to look like tents but for dogs. They are super easy to fold down for storage or to transport elsewhere. They still provide a sense of security, but there is greater visibility and ventilation. Generally, mild-mannered dogs not prone to chewing will do better with this kind of crate. More likely than not, this will not hold up well against dogs who still need training. In addition, it is not good for traveling in a car. Rather, this type of crate can work if you need to pack up a suitcase with it or even to take your dog hiking or camping with you. In many cases, these more temporary designs can be a better alternative than leaving your dog alone all day. However, as a permanent fixture in your home you may want to look at alternative crates. A metal dog crate is perhaps the most durable style out of the bunch. There is good variety to be found with metal crates too because they can be made from a number of different materials from aluminum to steel. Metal dog crates typically provide as much visibility and airflow as wire crates. However, there are some crates that have solid walls. So, if you are looking to go with this type of crate, you can decide whether or not your dog will be more comfortable seeing everything or having minimal visibility. With these types of dog crates, they can be fixed or folding. You are more likely to find a folding kind by searching for aluminum crates. Pertaining to which types of dogs these are suitable for, if you have a more aggressive kind or one that just requires a greater level of security, metal crates can do the job. They can withstand most of what your dog will throw at it, and they’re practically chew-proof. One thing to note about this style of crate is that they are not always lightweight. Meaning, unless you get a folding one, they’re not good for traveling. Rather, these crates can work well for being a permanent fixture in your home that your dog can go to whenever they need to. If you care about aesthetics, then you may want to search for the more decorative dog crates. These can be made from a variety of material from plastic to metal, but most decorative types are made from some kind of wood. These are designed to blend in with the furniture in your home so it looks more welcoming for you, your guests, and even your dog. It is apparent that these types of crates will not work well for travel, but their entire purpose is to blend in with the décor of your home. Also, decorative crates may not be the first choice if you have more destructive dogs or dogs that are not house trained yet. A decorative crate offers more comfort for your pet than anything. A well-trained dog that just needs their own space will probably feel more at home with one of these crates. If you’re feeling adventurous, you can even make your own DIY wooden dog crate. Regardless of what style of dog crate you want to settle on, before you buy anything, it is important that you know which size to choose. You need to take into account not just your dog’s size, but how much space they will need to get in and out comfortably. Dogs will tend to cry or whine if they are not comfortable in their crates. They need space, but not too much. You should know the height and length of your dog when determining which size crate to purchase. Measuring your dog is a simple task that should take little time. For length, you can measure from the tip of their nose to the base of their tail. It isn’t necessary to measure the tail unless it’s overly large. Once you get the measurement, add a couple of inches to it to account for moving room inside the crate. For the height, make sure your dog is sitting and measure from the floor to the top of their head. Be sure to account for their ears if they stick up. Likewise with the length, add on a couple of inches to the final measurement. If you don’t have time to measure your pup, just keep it simple. Larger dog breeds such as labs, dobermans, and bernese are going to need a large dog crate. More petite breeds such as dachshunds, chihuahuas, and pomeranians can be comfortable in something smaller. Though dog crates come in a number of sizes, you can always consider resizable options. A resizable dog crate is beneficial if you’re crate training a puppy as it can grow with them. It’s convenient and can save you money over time. Although there is a variety when it comes to selecting a dog crate, you may still want to consider going with heavy-duty crates. Many of them are designed to be borderline indestructible. Even though you crate train your dog, a determined one can chew their way out or break it. With a heavy-duty crate, you reduce the chances of that ever happening. If you are going for a sturdier crate, you can help your dog feel more at ease by adding some additional accessories to it. For instance, a nice bed and blanket can do wonders, helping them feel less like they’re trapped. Beyond durability and security, a well-built dog crate can last you and your dog a lifetime. You don’t want to go out and buy a new crate every couple of years because your dog keeps wearing it out. A heavy-duty crate is a good investment to make. If you have a big dog, you need a strong crate. While most dogs eventually start to feel comfortable in their crates, there are always a select few who will try anything to get out. If that’s the case with your dog, you already know how hard it is to keep him or her from destroying a crate. Fortunately, there are stronger options out there that are virtually indestructible. Guardian Gear’s ProSelect Empire cage will stand up to an amazing amount of abuse from a dog while still providing the kind of environment a dog needs to feel comfortable in his or her own space. This crate is easily one of the toughest-looking crates on the market. Made out of metal and strongly reinforced, it’s tougher than most dogs want to deal with. It’s also on wheels, making it perfect for those who need to move a crate out of the way when their dogs aren’t in them. The crate itself is a nice piece of engineering and it’s actually a little lighter than you might expect, though the metal itself is very strong. If you absolutely need something that’s going to keep your dog safe, this is probably the kennel for you. On average, this crate works great. When there are problems, it’s fairly easy to get customer service to send you what you need. While there have been problems reported with the hinges and the wheels, the truth is that most dogs aren’t going to be able to even put a dent in this cage. Unless your dog is fighting for its life to get out, he or she shouldn’t have the strength to get out of this crate. Durability and convenience don’t always go together. After all, some of the most durable crates on the market today are a huge pain to put together, and they certainly aren’t meant to be carried around. On the other hand, some of the most convenient crates just won’t stand up to the abuse of a strong dog. Fortunately, Grain Valley’s collapsible crate really does bring the best of both worlds by combining a design that’s very easy to collapse with one that will stand up to all but the most absurdly determined of dogs. This crate’s design is ingenious. While it’s made of aluminum and reinforced to an almost ridiculous degree, it can also be collapsed with relative ease. That means you can leave your dog in a crate while you’re out, but you can still put that crate away with just a few minutes’ worth of work once you come home. It’s one of the best crates both for those who have limited space in their homes as well as for those who travel. Fortunately, it’s also so strong that you’ll never have to worry about your dog collapsing the crate on himself or herself. To be fair, this crate isn’t going to hold a dog who is strong and absolutely determined to get out. The vast majority of dogs aren’t going to be able to get out of this crate, but dogs who regularly chew through metal are just too strong to be held by almost anything. As such, this crate can be recommended easily for all but the most determined of strong dogs. The classic metal dog crate only needs to be able to do a few things. First and foremost, it needs to be able to keep your dog secure when you’re not able to keep an eye on him or her. It also needs to be able to provide your dog with a safe enough space that he or she feels comfortable. Finally, the crate needs to be able to be moved with relatively little effort, especially if you are planning on traveling with your dog. Fortunately, this crate does all of that. This is the standard for how metal crates work. The design is very simple to put together, needing no tools. You’ll simply flip up the sides and clip them together, something that can be done by a practiced hand in about a minute. Your dog still has plenty of room to move about, and there is nothing that will constrict air flow. It’s a great place for your dog to stay when he or she needs to be out of the way or when you want to make sure that he or she is feeling safe in an unusual situation. The only downside here is that a determined dog can escape from this crate. This is not a problem for the vast majority of dogs, but a strong and determined dog will be able to get out. If your dog is fine with crates, though, this can be a great fit for him or her. Are you planning on moving to a new location in the near future? If so, you know you will need to make accommodations for your favorite furry pet. With its durable plastic construction and easy portability, the new Petmate Sky Kennel is a great fit for the occasion. Although not recommended for larger than normal breeds, the Petmate Sky Fennel can easily house small to mid-sized dogs for safe travel during long rides across the country. Whether you are moving to a new home or simply vacationing in a different state, this model comes with all of the features that are necessary to ensure a safe and happy ride for your pet. Unfortunately, no dog crate is “airline approved”, but this one is probably the most well-suited for air travel. The unit comes with a full ventilation system that will keep them breathing freely during their travel. It also comes equipped with a secure locking front door that will give owners peace of mind. The Petmate Sky Kennel has been specially designed to give your dog plenty of room to move around in. This is not one of the conventional storage models that basically give them room to breathe and not much else. Because of its wide and tall design, your pet will be able to move freely, either standing, sitting, or lying down as they choose. This is a major source of comfort. For owners of small to medium breeds that need to travel on a frequent basis, the new Petmate Sky Kennel comes very highly recommended. Moving to a new location isn’t always the easiest thing to plan. It can get even more tricky if you have pets that need to come along for the ride. Luckily, an efficient and cost effective solution is available. The Casual Home 600-44 Pet Crate has recently appeared on the market. If you’ve been looking for a quick and easy pet crate design to transport your pet in, this may just be the one. This trendy new model comes complete with a range of features that are guaranteed to appeal to dog lovers all over the world. First and foremost is its full wood design. From top to bottom, this is one unit that is guaranteed not to snap or break under pressure. It is also able to double as an attractive piece of furniture when placed inside the home. Prospective buyers should also keep in mind that this end table dog crate comes with a locking front door that will give pet owners peace of mind. The unit is specially ventilated to make sure that your dog stays cool and gets the air they need to remain healthy. At the end of the day, the new Casual Home 600-44 Pet Crate is an attractive, durable model that does exactly what it claims to. It’s priced affordably and can be easily assembled in a matter of minutes. If you’re searching for a good mid-range pet crate, you can hardly do better than this attractive new model. Being able to have an open top on a dog crate is a nice feature. After all, it’s a great way to make sure that you are able to interact with your dog while still keeping him or her safe. While it’s fairly easy to find this kind of crate for a small puppy, it’s a little harder when you know that your dog has a tendency to break out of crates. This is why it’s so important to look at a product like this heavy duty crate, which combines the best of both worlds. Heavy duty crates are usually meant for dogs that have a tendency to chew through less durable crates. In this case, the heavy duty aspect is also meant to help keep very energetic dogs safe in one place while they are still able to interact with their owners. This crate is strong and made of metal, but the roof can come off in order to allow for more interaction. A great choice for those who need to bring energetic dogs on the go, it allows pet owners a chance to play with their dogs without having to worry about how safe they may be in their crates. The only bad news about this crate is that it only holds a dog up to seventy pounds. This means that the heavy duty crate, which is usually meant for larger dogs, won’t hold some of the bigger pets out there. If you’ve got a medium size dog that is an escape artist, though, this might be a good fit for you. There’s absolutely nothing wrong with going for the basics when it comes to a dog crate. After all, the basic design is so popular because it works. Four walls, a couple of doors and a solid surface are really all most people need when they’re looking for a crate. This particular Amazon model may not be much different from the crates that you’ve seen in a thousand other places, but that’s really what makes it so great – Amazon chose not to reinvent the wheel with this crate. If you’ve ever had a dog, you probably already know how this crate works. It’s easy to put together, with sides the clip into one another. You can pull it down in about thirty seconds, and set-up only takes about a minute. The crate is fairly sparse, with an optional divider that does make it possible to keep two dogs in the same unit. There’s nothing fancy here, but you really don’t need much when you’re just trying to make sure that your dogs have their own space in which to rest and get away from it all. Best of all, the price is relatively cheap when compared to other similar options. There’s not a lot to say that’s negative about this crate. Yes, incredibly strong dogs can knock it down – but the average dog won’t even try to do so. If you need a good crate, this is where you need to start. A design that stands the test of time really doesn’t need to do much more than it already does. Soft sided pet carriers have some real benefits. They are, for example, usually much better for travel than their metal cousins. They’re also a lot easier for most people to deal with when it comes time to pack them up, as they don’t take up quite the same amount of space – or cause the same amount of damage. Soft crates also tend to feel a little more humane for dogs, as there’s no fear of your dog hurting himself or herself against the edges. If you need a soft crate, this might be the best choice for you. This soft crate is unique in that it has three doors. This makes it much easier for you to get your dog into the crate, especially if he or she is the type to run around when it’s time to go to sleep. The crate is also very easy to collapse and move around, which makes it useful for those who typically use this kind of crate on the go. In short, it’s a good combination of being dog-friendly and travel-friendly, which makes it perfect for some pet owners. If pink isn’t your style don’t worry, this model comes in a vast selection of colors. The downside to this crate, as with any soft crate, is that it can be chewed through. If you keep an eye on your dog, though, this shouldn’t be an issue. If your dog is generally not averse to going in a crate or you want something that’s great for travel, though, this may be the best crate for you. While it’s certainly nice to be able to have a sturdy dog crate, finding a place to put it can be a problem. Dog crates need to be big enough for your dog, of course, but finding a good way to store your crate also has to take priority. If you want to make sure that you’ve got a good crate that will still be able to be hidden away, getting a foldable crate is the way to go. One of the better foldable crates on the market is the soft foldable crate for 2PET. This foldable crate really stands out because it’s actually fairly rugged for a soft crate. While most of the outside is fabric, it still has a steel a frame inside. This means that it’s going to hold up to more punishment and it won’t deform just because you’ve packed it away. It’s also washable, which is very helpful for those who want to make sure they aren’t always carting around a smelly crate. The only downside is the soft construction. It’s not a problem for most dogs, but big dogs might cause some issues if they want to get out. If you get the crate for the right size of dog, though, you shouldn’t have any problems. If you have pets, you know what an inconvenience it can be to cart them around from point A to point B. This is particularly true with cats and other types of animals who aren’t as adaptable to the car riding experience as dogs are. For this reason, you need the Merry Pet 2-in-1 Configurable Pet Crate. This handy new pet crate comes equipped with everything you need to make transporting your pets a safe and enjoyable experience. This particular model comes fully stocked with features such as a removable plastic tray. This tray is particularly useful when it comes time to clean up the mess that a pet may leave behind. The unit can also be easily disassembled, with its components being reusable as pet gates. For these reasons, the Merry Pet 2-in-1 Configurable Pet Crate is one of the most popular and useful pet crates currently on the market. The Merry Pet 2-in-1 Configurable Pet Crate is a popular best seller in this category precisely because of its extreme versatility and affordable price. If you are moving your pets along with you to a new home or apartment, it’s a great way to keep tabs on them while you travel. The bottom tray will keep them cool and comfortable while also allowing them to attend to the call of nature as needed. The locking front gate will keep them safely inside. Due to its convenient size and solid construction, this unit comes highly recommended. In all honesty, there’s something comfortable about getting a traditional dog crate. The design has been around for so long that you know you won’t have to worry about your dog getting out or feeling uncomfortable. These standard cages generally stand up to almost anything a dog can throw at it, but are still portable enough that you can bring them across the country if necessary. This Two-Door Great Crate is a real classic. Construction is a snap, as is taking it down. Most dogs enjoy the extra air flow that it gives them, and the stable floor makes a good base for putting down bedding. It’s an excellent piece of engineering that hasn’t changed in years, and that’s honestly for the best. This is one wheel that does not need to be reinvented. The only downside is that huge dogs can wreak havoc on this crate. It’s not a fault of the crate, of course, but it’s due to the fact that a determined dog can take down almost anything. So long as your dog is generally comfortable in crates, he or she will love this product. Some pet crates are made for small dogs whose reasonable tempers make them ideal candidates for storage in such a unit. But if you have a big, aggressive, energetic dog, you’re going to need something a little stronger. This is where the new LUCKUP Heavy Duty Dog Cage comes in. Its heavy steel frame construction gives it the edge where similar models have failed. But this isn’t even the main reason why this particular unit comes so highly recommended. There is much more to the new LUCKUP Heavy Duty Dog Cage than just metal bars. A huge part of its appeal is its easy assembly. The unit can be quickly put together in a matter of minutes. Four wheels and eight screws are all you need to complete the unit and get it up to speed. The unit comes with a selection of three different doors for different purposes. The large door in front is the perfect place to let your dog in and out of the cage. There is also a small door in the front that you can open in order to provide food for your pet. Finally, there is a small door on the top of the unit in case your pet needs to be quickly extracted for any reason. The new LUCKUP Heavy Duty Dog Cage is the perfect crate to transport larger dogs over long distances. It comes in a variety of sizes, but the 42 inch model will work for most pups. If you’re searching for the ultimate quality model, this is the one that comes most highly and frequently recommended. The new MidWest Homes for Pets Ultima Pro dog crate has just been released. Sure, you love having Fido sit next to you in the car while you’re out for a drive. But it just isn’t safe or advisable to have him occupy shotgun during a long and difficult cross country trip. If you’re planning to make a move to a new location and want your dog to come with you, you’ve got to plan ahead in an appropriate manner. And this is just where the new MidWest Homes for Pets Ultima Pro dog crate comes in. In fact, this particular model is one of the strongest and most reliable models currently available on the marketplace. Industry experts have rated the Ultima Pro as the one that makes full use of the thickest wire gauge, as well as the most durable metal. This means that the MidWest Homes for Pets Ultima Pro is a natural home on the move for strong dogs who can easily break out of lesser, more flimsy shelters. It’s the perfect match for people who travel often with their dogs in tow. The unit comes with a special subdividing panel that will allow you to store two dogs at once in the shelter. All in all, the new MidWest Homes for Pets Ultima Pro is a highly recommended temporary home for your beloved pets. Its durable construction and reasonable price make it a must for you on your next trip. The 36 inch model is a great fit for medium sized dogs. Are you planning to spend some time out in the open? If you’re headed for some quiet time in the great outdoors, why not bring your best friend along? The brand new Noz2Noz Soft-Krater Indoor and Outdoor Crate for Pets is the perfect vehicle to transport your favorite pet along with you to the scene of the action. The Noz2Noz model is made with a special new heavy duty tight weave mesh fabric that is designed to be strong, durable, and adaptable at once. The mesh weave fabric keeps the dog safely and securely within the unit while keeping them cool and giving them plenty of fresh air for ventilation. The unit itself can safely house dogs who weigh up to 90 pounds. After your outdoor adventure is over and you return home, you’ll find that the unit still has plenty of use as an indoor shelter for your pet. It comes with specially rounded corners that are designed to protect your home furniture and décor. Anyway you use it, this is bound to be a unit that will see plenty of use. Its simple design allows it to be set up and later disassembled within a few short minutes. This and other features have given it worldwide popularity and very strong sales. The Noz2Noz Soft-Krater Indoor and Outdoor Crate for Pets is a unit that comes heavily recommended by industry experts and pet owners alike. If you’re constantly on the move and need a strong, durable pet crate for your dogs, this is the one. The new Sliverylake XXL Dog Cage comes equipped with powerfully built steel cage construction that will stand up to the job. Whether you’re on the move due to being in the military or transporting pets to dog shows, this long lasting cage is a real lifesaver. The Sliverlylake XXL Dog Cage is specially designed to handle the needs of larger breeds. These may include Doberman, Afghan Hound, Greyhound, St. Bernard, Samoyed, Siberian Husky, German Shepherd and many more. The cage is extra large, roomy, and fully ventilated. It also comes with a removable plastic tray at the bottom that is perfect for removing and disposing of the occasional bit of pet exhaust. The unit is also well regarded for its portability. It comes complete with a set of four wheels, two of which can be safely locked to hold it in place for storage. Once in place, you can rest assured your dog will be safely contained. The crate features a double door design, granting access from the front and also the top. While other models claim to be able to meet the needs of larger dog breeds, this is the one that can fulfill that function for a price that won’t break your budget. For that reason and many others, the new Sliverlylake XXL Dog Cage comes highly recommended by pet owners and industry experts. The new Walcut Heavy Duty Strong Metal Pet Dog Cage is a model with much to recommend it. From its durable steel construction to its easy portability, this is a unit that is clearly designed to fulfill its appointed task. We had a look at its features and came away with a clear appreciation for its quality. The first thing you’ll notice is that unit comes with four wheels to give it the ultimate edge in terms of portability. This alone is enough to recommend it to pet owners who need to keep tabs on dogs who weigh more than the average breed. Instead of having to lift or carry a heavy cage with an even heavier dog inside, just roll it along on the wheels into your car, truck, or RV. The next major recommendation we can give for this unit has to do with its double door entry design. You can access the cage from the very front in order to load and unload your dog or feed them treats during the long journey. You can also use the convenient door located at the top of the cage to extract them in case a mishap of some kind should occur. Although a bit on the pricy side, the new Walcut Heavy Duty Strong Metal Pet Dog Cage is well worth the investment. If you want to bring your pets along for the journey, this unit makes for an excellent storage device and temporary home. If you own several dogs of a larger breed than normal, you know what a nightmare it can be to have to transport them. If you have a reason to move frequently or if you enter your dog in national shows, you need a pet crate that can stand up to frequent use. For best results, you need a unit like the SMONTER Heavy Duty Strong Metal Dog Cage. This is a unit whose heavy and durable steel design can get the job done. The most important feature that the SMONTER Heavy Duty Strong Metal Dog Cage provides is its large size. Because it’s sized larger than most comparable models, it also doubles as a playpen and “cooling off” area for boisterous pets. This particular dog cage is also known for its extreme portability. With the simple addition of four wheels and eight screws, you can turn it into a temporary home on wheels for your favorite friend. The unit also comes with multiple access points. It includes the conventional side door for inserting or removing your dog, as well as a door on top for removing them in case of a mishap or to reward them with snacks. The SMONTER Heavy Duty Strong Metal Dog Cage has earned rave reviews from experts and customers alike for its affordability and durability. If you’re looking for a well priced cage that gets the job done in quick and efficient style, this may be the model that fits the bill. Sometimes, you just need a stronger crate than most. Some dogs are just motivated to escape, and they have enough strength to make that desire into a reality. While there’s no such thing as a crate that’s totally escape-proof, there are a few options out there that are as close as you can get. One of these is the DX5000 Aluminum Dog Crate from Zinger Winger, which is rated to hold larger dogs. If you’re looking for something that’s very strong and that will still keep your dog comfortable, this might be the crate for you. It’s got a great design to be sure, but it’s really the build quality that makes it stand apart. This is not your standard dog crate. Metal and strongly reinforced, it’s built tough enough that not even a human could get out without some significant effort. This is made for bigger, stronger dogs and it shows. Fortunately, it’s also very humane – most dogs enjoy this crate about as much as they enjoy any other crate on the market. While you’ll never find a way to get a crate-averse dog to enjoy going inside, most dogs don’t seem to have a problem. This is a solid crate for those who are tired of seeing their crates destroyed. The only downside here is that it’s a little tough to assemble. It takes about half an hour, which is longer than most want to spend on a crate. It’s more than worth the effort, though, especially if you are used to your dog immediately undoing your hard work. When have have a big dog, everything you buy him or her really needs to be a bit more heavy duty than the average dog item. Toys, for example, need to be reinforced, and so too do things like leashes and harnesses. It should come as no surprise, then, that your dog’s crate also needs a bit of extra reinforcement. That’s the general idea behind this heavy duty crate from Gelinzon, which will keep even the biggest of dogs safe and happy. 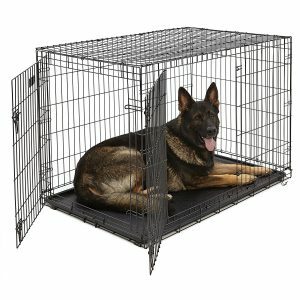 This big, heavy-duty steel kennel is perfect for those dogs who are rough on less significantly heavy crates. Built of steel and made to last, this is the kind of crate you need when you want to be sure that your dog isn’t going to escape. As a nice extra measure, it’s also built on wheels – something that will help to ensure that you can move the heavy crate around without having to hurt your own back. It’s a great little bit of convenience that makes this crate even better. The only real issue with this crate tends to be in terms of shipping. If you buy it from a third-party shipper, expect it to take a bit. This isn’t a problem for everyone, but you’ll definitely want to get this crate as quick as possible. After all, it’s nice to not have to worry about your dog. To wrap things up, the type of crate you purchase will boil down to where your dog is at with training and behavior. Not all crates work well for all dogs, so only you can determine which crate to buy depending on your pet’s temperament. Even so, a heavy-duty crate can provide you and your dog with the necessary security, space, and comfort. It can hold up over the years as well so your dog can have a long-lasting “home within a home”. Thanks for stopping by The Pampered Pup! We hope you found what you were looking for. Please come back soon!